NVIDIA Corporation (NASDAQ:NVDA) shareholders have witnessed a decrease in hedge fund sentiment during third quarter. Some hedge fund managers might have sensed the looming demand declines and bolted out. Nevertheless, NVDA was still the 67th most popular stock among hedge funds at the end of September (check out the list of 30 most popular stocks among hedge funds now). To the average investor there are a lot of indicators stock traders can use to grade their stock investments. Two of the less known indicators are hedge fund and insider trading interest. Our experts have shown that, historically, those who follow the best picks of the best investment managers can trounce the market by a healthy amount (see the details here). We were also able to generate large returns even by identifying short candidates. Our portfolio of short stocks lost 26.1% since February 2017 even though the market was up nearly 19% during the same period. We just shared a list of 11 short targets in our latest quarterly update. What have hedge funds been doing with NVIDIA Corporation (NASDAQ:NVDA)? At Q3’s end, a total of 56 of the hedge funds tracked by Insider Monkey were long this stock, a change of -2% from the second quarter of 2018. 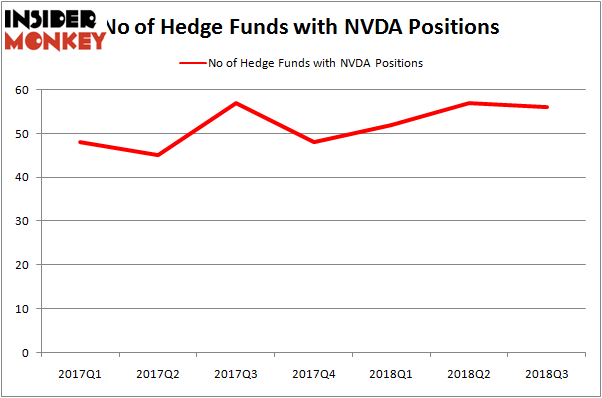 Below, you can check out the change in hedge fund sentiment towards NVDA over the last 7 quarters. With hedgies’ sentiment swirling, there exists an “upper tier” of noteworthy hedge fund managers who were increasing their holdings significantly (or already accumulated large positions). 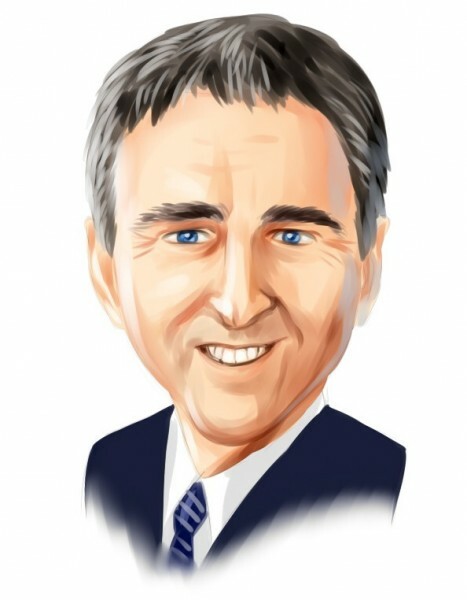 When looking at the institutional investors followed by Insider Monkey, Citadel Investment Group, managed by Ken Griffin, holds the number one position in NVIDIA Corporation (NASDAQ:NVDA). Citadel Investment Group has a $710.6 million call position in the stock, comprising 0.3% of its 13F portfolio. Coming in second is Lone Pine Capital, led by Stephen Mandel, holding a $628.2 million position; the fund has 3.2% of its 13F portfolio invested in the stock. Remaining professional money managers with similar optimism encompass quant hedge funds D. E. Shaw’s D E Shaw, Jim Simons’s Renaissance Technologies and Cliff Asness’s AQR Capital Management. Seeing as NVIDIA Corporation (NASDAQ:NVDA) has experienced declining sentiment from the entirety of the hedge funds we track, it’s easy to see that there exists a select few hedge funds that slashed their entire stakes last quarter. At the top of the heap, Josh Resnick’s Jericho Capital Asset Management dumped the largest stake of all the hedgies monitored by Insider Monkey, totaling about $79.3 million in stock, and Matthew Hulsizer’s PEAK6 Capital Management was right behind this move, as the fund dropped about $39.1 million worth. These transactions are important to note, as aggregate hedge fund interest was cut by 1 funds last quarter. Let’s now take a look at hedge fund activity in other stocks similar to NVIDIA Corporation (NASDAQ:NVDA). We will take a look at TOTAL S.A. (ADR) (NYSE:TOT), Netflix, Inc. (NASDAQ:NFLX), Comcast Corporation (NASDAQ:CMCSA), and PepsiCo, Inc. (NYSE:PEP). This group of stocks’ market values are similar to NVDA’s market value. As you can see these stocks had an average of 59.25 hedge funds with bullish positions and the average amount invested in these stocks was $5078 million. That figure was $4088 million in NVDA’s case. Comcast Corporation (NASDAQ:CMCSA) is the most popular stock in this table. On the other hand TOTAL S.A. (ADR) (NYSE:TOT) is the least popular one with only 13 bullish hedge fund positions. NVIDIA Corporation (NASDAQ:NVDA) is not the least popular stock in this group but hedge fund interest is still below average. This is a slightly negative signal and we’d rather spend our time researching stocks that hedge funds are piling on. In this regard CMCSA might be a better candidate to consider a long position than Nvidia. We also don’t want to catch a falling knife at this point.